Norwich Red was a plant dyeing process for madder invented by Michael Stark in the 19th century. It was special for producing exactly the same shade of red on wool as on silk. Sadly the recipe has been lost. Otherwise I would definitely have tried it out for the quilt shown here. 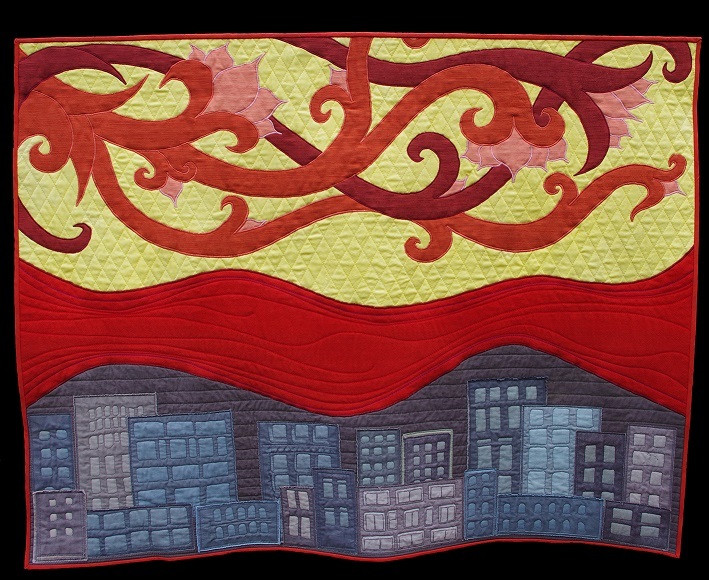 The decorative upper section is made from layers of silk/wool gauze dyed with madder. You can see how these shades differ to the pillar box red of the river – which consists of 100% wool. The quilt was inspired by the sumptuous woven shawls exported from Norwich to royal courts around the globe in the Victorian era. The weavers themselves were often on the breadline. The Wensum is a chalk river, making it ideal for madder dyeing and it was reputed to have ‘run red’ when the many dyehouses in the city centre emptied their vats. I have no evidence that there were any dyers in my family tree, although my family has been in Norfolk for many generations. It’s probably pure coincidence that I have the perfect name for what I am doing. I’ve spent most of my life embarrassed about having a name that sounds like an instruction to ‘keel over’ and ‘shuffle off this mortal coil’. I like my surname a lot more nowadays. This entry was posted in history of dyeplants, madder, stitched textiles on 1st August 2015 by susan dye. I have experimented with something called ‘Colour Play’ developed by Vanessa Volpe from Northampton. This is a healing therapy akin to psychodrama, but using colours rather than words to communicate. Vanessa understands how colours resonate with different aspects of our personalities. When facing fear of the unknown it’s a good idea to imagine breathing yellow into your lungs and body to infuse you with confidence. Anish Kapoor has said that when your visual field is full of pure yellow something very special happens. He dislikes spelling out experiences for the viewer, but he is on record saying that yellow is the ‘passionate’ part of red, whereas blue is the ‘godly’ part. Goethe, on the other hand, described yellow as serene, gay, softly exciting and gladdening. I was certainly gladdened the other day when I obtained these beautiful yellows on silk, linen and cotton. I had been feeling rather overwhelmed by all the preparation work I still needed to do for my display in the student gallery at the Festival of Quilts. 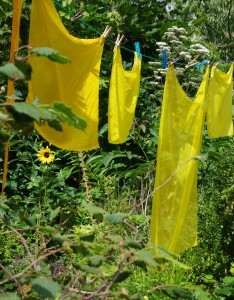 A morning out with the dyepots ‘breathing yellow’ lifted my spirits. 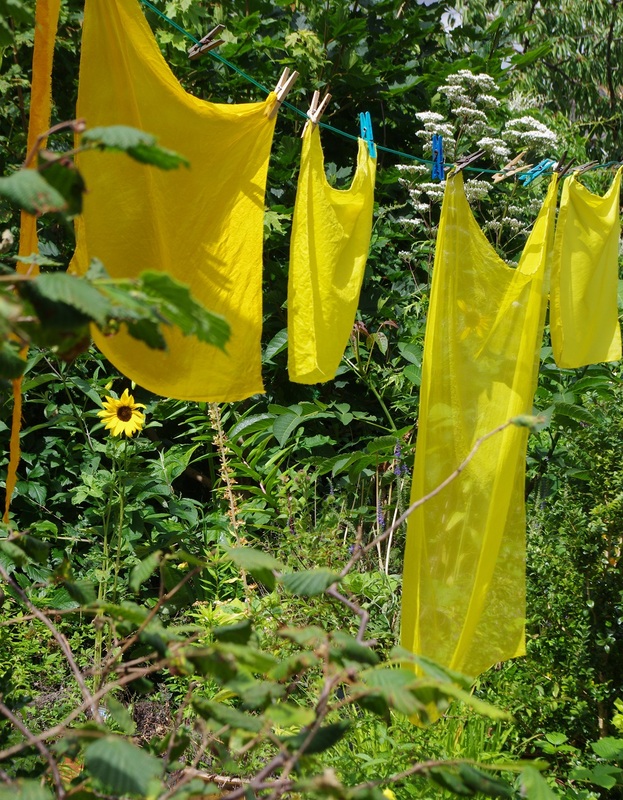 This entry was posted in dyers greenweed, learning to use dye plants on 1st August 2015 by susan dye. 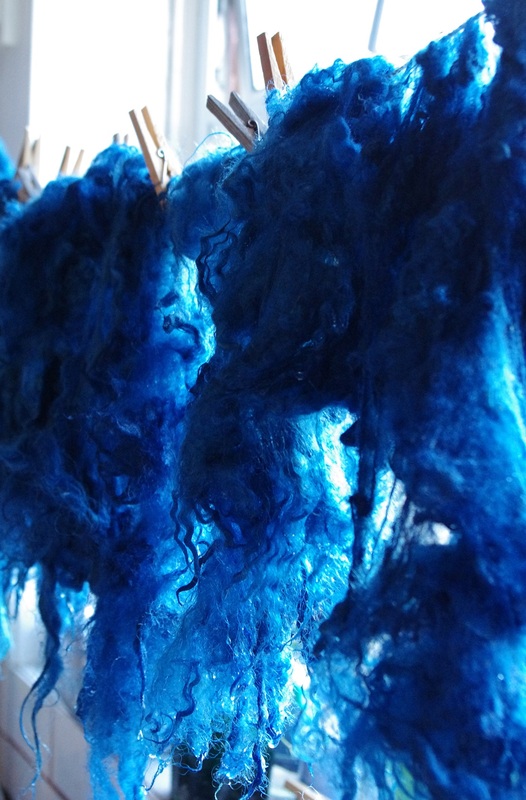 Therapists say that blue is connected with communication, so it seems apt to start with a post about woad and Japanese indigo. These are the two easiest indigo-bearing plants to grow here in the temperate climate of the South East of England. We grow both of these on our allotments each year. It’s easy to save seed from woad and the plant is hardy in our climate. Anyone can grow it. Japanese indigo i s much harder from a horticultural point of view. It’s not frost hardy and is prone to pests when over-wintered under glass. 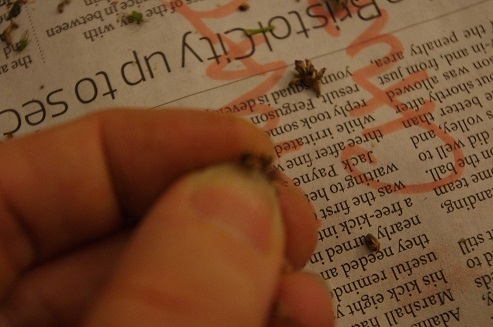 Our growing season is just a bit too short for seeds to set reliably in any quantity. But it yields a lot more indigo than woad. One of our ‘labours of love’ is picking the tiny seeds from dry flower heads at the end of each season to ensure we have plants for the following year. When it comes to creating a woad or Japanese indigo dye vat there really is no substitute for learning alongside someone more experienced. Over the following years we have refined our plant dyeing techniques enormously. Some of our current practice has evolved out of our own experiments. But just as much has come from attending workshops with wonderful teachers, in particular Jenny Dean, Penny Walsh, Jane Meredith and Debbie Bamford. The Weavers Spinners and Dyers Guilds are an excellent learning resource and way to connect with like-minded craftspeople. This entry was posted in growing dye plants, japanese indigo, woad on 1st August 2015 by susan dye.